Just between you and me … I’m starting to freak out just a little. My middle son’s wedding is less than two weeks away, and I don’t have all the projects I need to finish completed. And I still don’t know what I’m going to wear. I don’t want something formal. That just isn’t who I am. But I’d like to look nice, while still being comfortable. I’m open to suggestions! 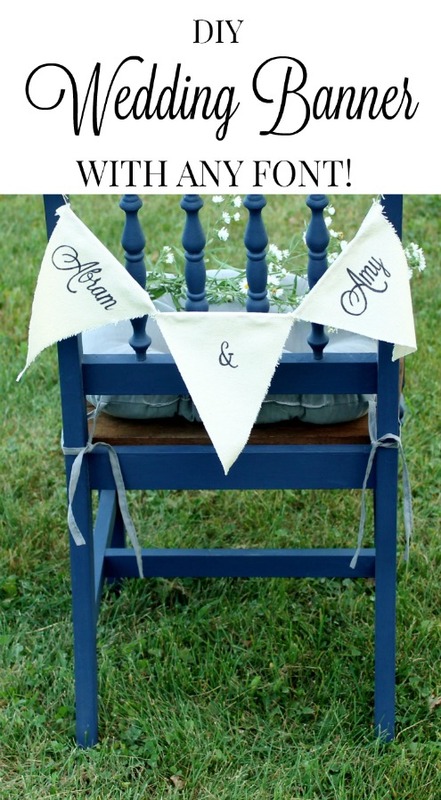 The venue where my older son got married was so nice, the only thing I had to make was a pallet wood sign and decorate the arbor. 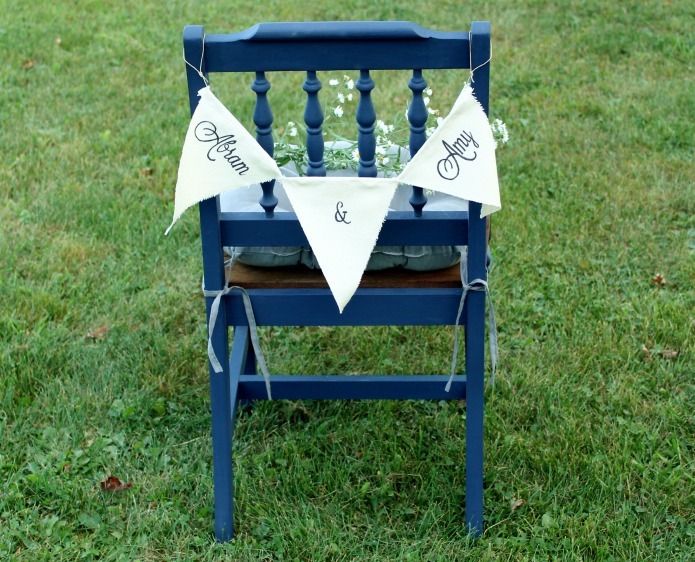 I’m making a lot more decor for my middle son’s wedding, and I’m worried about getting it done. Breathe in, breathe out, do the next thing. I keep telling myself that. Okay, back to this project. 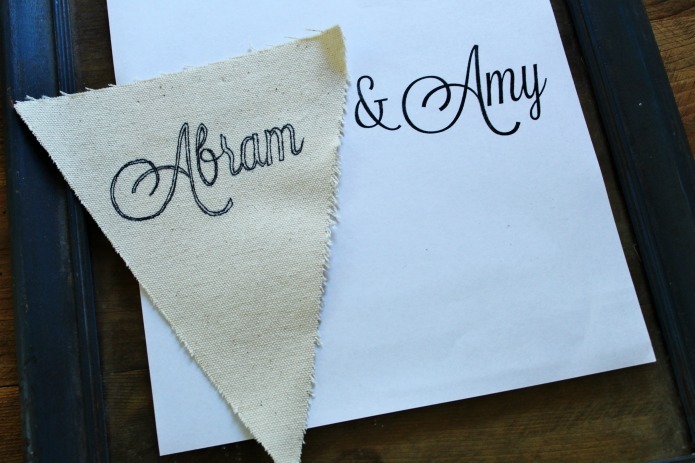 The project I’m sharing today is a canvas wedding banner, but it can be made for home decor or any special occasion. 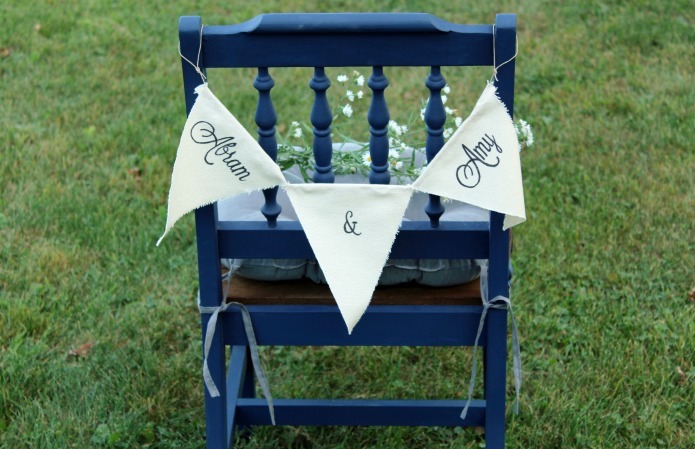 It would be fun to make them for holidays, family reunions, birthdays, and baby showers. The best part of making your own banner using this method is that you can choose any font you want. 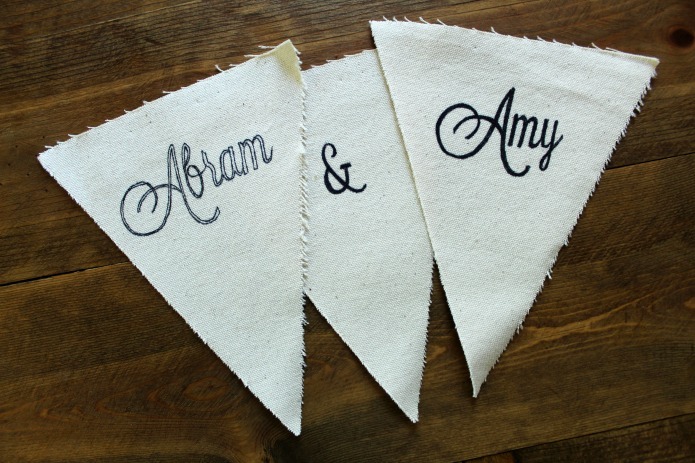 I had leftover pennants from making my neice’s wedding banners, so I was glad to use them up. I’ve gotta give my husband credit for this project. He did almost all of it, and he did a great job! First you’ll need to choose a font. I used Lavanderia, which is one of the fonts I’ll be using on another project for them. You may need to install whatever font you select before the next step. I get most of my fonts at Dafont, which has hundreds of free fonts organized by the style of font. I used Picmonkey to type their names, then printed it on regular copy paper. Tape the paper on a window with the light shining into it, then tape a pennant over the first word. You’ll see the words illuminated behind the canvas. Trace over the words with a fine tip permanent marker. These pennants were made at night, so he used a glass photo frame instead of a window and held it up to a light. You can trace just the outline, but I preferred them filled in. 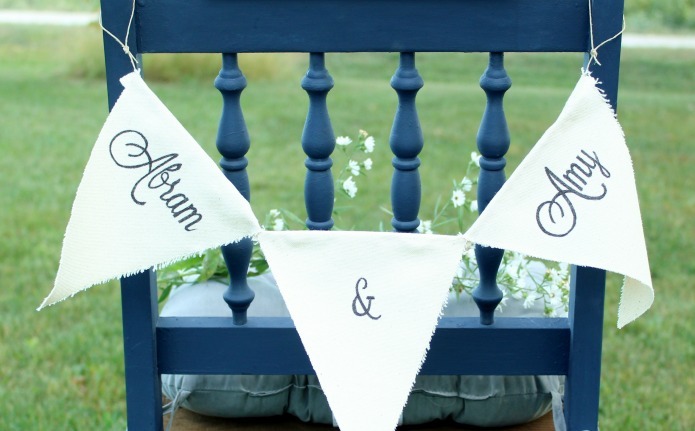 Attach the pennants to ribbon or twine. Either punch holes in the the top of the pennant, or fold it over the twine and hot glue in place. I’ll be sharing more about the chair it’s hanging on soon, with some tips about painting chairs! On to the next wedding project! Hang in there kiddo , you’ll get it all done. Breathing is a very good idea ! Thanks Sandy – I wish you could be there! It’s going to be a beautiful day! Love the banner! Thanks Linda. I am SO looking forward to it! Just be you and everything else will fall into place. Everyone will see how talented you are, these banners are wonderful.